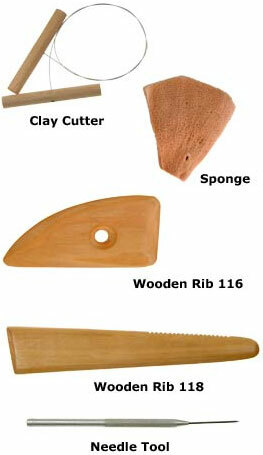 * The toggle clay cutter is a 16" piece of cutting wire attached to wooden handles used to cut sections of clay in the wedging process and for removing thrown pots from the potters wheel. * The 4" Mediterranean elephant ear sponge is long lasting and durable. * Its shape allows it to be held comfortably in the hand while throwing pots. * Its strength and shape help to absorb excess water applied when bringing up the walls of the pot. * The hardwood rib, No. 116, is essential to a potter as a trimming tool or needle tool. * Approximate length - 4 1/2"; approximate width on widest side - 2". * The hardwood rib, No. 118, is essential to a potter as a trimming tool or needle tool. * One side is partially serrated. * Approximate length - 7 1/2"; approximate width on widest side - 1". * The needle tool is a universal trimming and cutting tool with an aluminum handle and fine point cutting needle and curved handle support. * Approximate length - 6 1/4".